Has Joe McPhee ever made an album that didn't warrant a good many repeated hearings? Probably not. At least in all of his recordings that I've come across, from the rare-as-hens-teeth Hat Hut albums to his work with Pauline Oliveros' deep listening band, there is nothing that I've put on the shelf and never returned to. And it's good to say that this release is no exception. So although there is always the danger that, when we start to revere our heroes and give them god-like status, sooner or later comes the moment of disappointment. Joe McPhee is doing a great job of bucking the trend. The musicians he works with, whether top drawer players or relative unknowns, are always superb. On this album he links up with three compatriots from the Chicago-Scandanavia axis that has become one of the most important forces in improvised music. 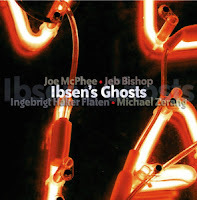 Jeb Bishop, ex-luminary of the Vandermark 5 and trombonist of choice within Peter Brotzmann's Chicago Tentet, joins McPhee on the front-line with a rhythm section comprised of Ingebrigt Haker-Flaten on bass and Michael Zerang on drums. Moving away from his usual multi-instrumental approach and sticking to tenor saxophone, the range suggests a sound somewhere between Mulligan-Brookmeyer and Lacy-Rudd. But this is something new. Both McPhee and Bishop have played far on the outside but while these pieces are framed as improvisations between the four participants, neither strays too far from their lyrical side. The opener begins with a mournful trombone laying out thematic concepts. McPhee joins in the mourning against Zerang's slow rumble. Then it all gives way, Bishop becoming increasingly percussive, as if trying to match the drummer's off-kilter rhythms before this in turn disintegrates and McPhee, his tone reminding me of Charles Tyler, comes storming in. And so it continues, each track revealing just why they are regarded as amongst the greatest improvisers currently performing. So, is this top drawer McPhee that you need in your collection straight-away or something less essential that you can pick up further down the line? If you're reading the review solely on the basis of McPhee's presence, then these recordings, while great, are not essential. But if you take the quality of the other musicians into account - and certainly any revelation of Jeb Bishop in such an intimate setting is worth investigation - then this should be one to locate at the earliest opportunity.